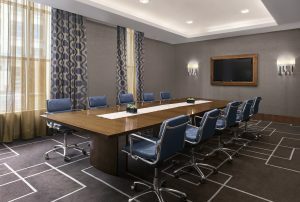 Overlooking Edinburgh Castle, the Sheraton Grand Hotel & Spa, together with the vibrant One Square bar & brasserie and award-winning One Spa, is an inspirational gathering place in the heart of the city’s financial district. 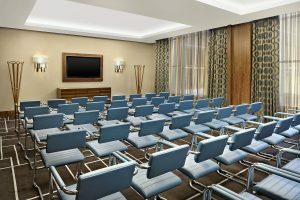 Home to 14 flexible function rooms, each with integrated AV technology and natural daylight. 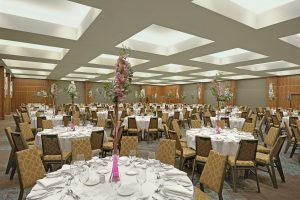 The hotels dedicated meeting and events complex is the largest of any hotel in Edinburgh and is capable of hosting everything from an informal team meeting to a lavish reception for a thousand guests. Blending contemporary comfort and subtly Scottish materials, the hotels 269 stylish bedrooms feature innovative media hubs, mood lighting, spacious glass-walled bathrooms with many overlooking the city’s iconic skyline. Guests on the Club Level can enjoy continental breakfast and evening drinks and canapés in the exclusive Club Lounge. A world of relaxation awaits at One Spa, Scotland’s most renowned urban thermal spa experience. The iconic rooftop Hydropool is just the beginning of the journey to wellbeing and rejuvenation. The Thermal Suite offers an unrivalled range of uplifting water, salt and heat experiences designed to help guests rebalance and refresh body and mind. A comprehensive range of soothing spa treatments are available, together with the inspirational 19-metre swimming pool, gym and studios. From the well-stocked bar to the ever-popular tables overlooking Edinburgh Castle, One Square is somewhere to spend leisurely afternoons, to meet with friends for dinner or sit out on the terrace and sip a perfectly-poured G&T.